Micro Focus has been the market leader and provider of distributed COBOL development tooling for nearly 40 years. Our comprehensive COBOL portfolio includes our next generation technology, Visual COBOL®, our classic COBOL product offerings Net Express®, Server Express™, ACUCOBOL-GT® and RM/COBOL® solutions as well as complementary solutions for COBOL application analysis and COBOL data file modernization. COBOL Analyzer provides analysis, intelligence and reporting tools designed for Micro Focus COBOL applications. It enables developers, analysts and executives to achieve a deeper understanding of their application portfolio providing both business and technical insight. For ISVs or corporations, this solution delivers actionable insight to quickly identify, prioritize implement and document application change activities. Visual COBOL is the next generation solution for COBOL application development and deployment. This unique technology allows COBOL and modern language developers to modernize COBOL systems using Visual Studio and Eclipse as well as deploy COBOL applications and services to new platforms, including .NET, JVM, Docker and the cloud. 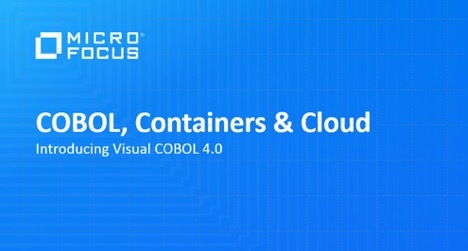 Visual COBOL is the first choice for all new organizations coming to the Micro Focus COBOL platform. For the existing ACUCOBOL® community, the extend™ product suite provides software solutions to maintain and modernize ACUCOBOL applications across more than 600 deployment platforms. For the existing RM/COBOL community, RM/COBOL is a stable, high performance COBOL platform providing a familiar environment for developers to maintain and improve RM/COBOL applications. Net Express (for Windows) and Server Express (for Linux and UNIX) have been the trusted and proven choice for distributed COBOL application development for nearly 20 years. These classic tools enable COBOL developers to build and maintain enterprise applications.